By now you know the SRX has returned, and the menacing blue beast is packed with a few tweaks to make the Sidewinder in SRX clothes even faster than last year’s speed champ. To gain more warp factor speed the new SRX now spins a shallow 1-inch lug Ripsaw track and touts a lowered ride height. 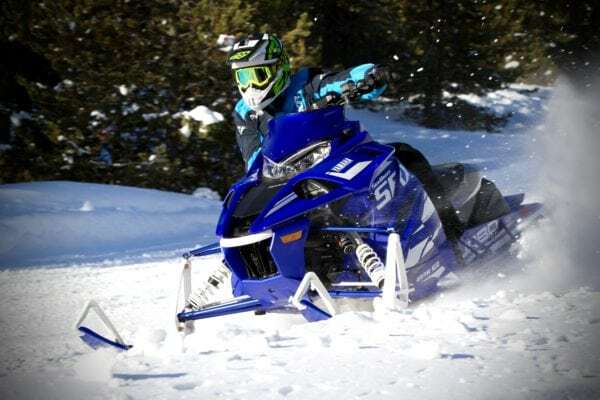 To attain the lowered ride height, the use of new dual-rate springs lets the sled have more “ride-in” but maintains final rates to resist bottoming. Being the hero model for 2019, the SRX also receives IQS shock control, new handlebar controls, and of course classic SRX colors. While we can’t say for certain how much faster the SRX is than last year’s Sidewinder, we were surprised at just how much fun this set-up is on the trails, even those littered with bumps. The 1-inch lug track allows the sled to “slip” over bumps and be “backed-in” on the corners. This combined with power-on and pitched exits makes for a laugh inside your helmet ride we can’t get enough of. Don’t worry, it’s still stupid fast.